I love the wild side of North Cyprus, from the migrating birds to the wild flowers that herald the arrival of spring in the mountains, but most 'eco-minded' visitors just want to see one sight, hatching sea turtles in northern coast of Cyprus. It certainly is heart-warming to see these miniature turtles scuttle to the sea, if a little distressing to realise that elsewhere in Cyprus, the bright lights of bars can prove more alluring than the natural fluorescence of the waves. Which is why I always point visitors to the Goatshed at Alagadi beach, the SPoT (Society for the Protection of Turtles in Northern Cyprus) information centre. The student volunteers here work for the Turtle Project by protecting and caging the nesting areas against foxes and other predators. 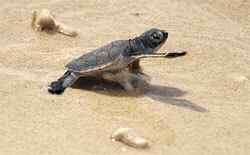 They also organise public viewings of baby turtles releases, starting at about 5.30pm most evenings. (Booking is essential). You can also join night watches, both for the females laying eggs (they do this every two weeks or so) and for the hatchings themselves. Seasoned night watchers take blankets and sleep on the beach, as it can get chilly in the middle of the night down there! Now I know some people think these organised releases are too 'unnatural', but think of it this way. That scuttle to the sea is the most dangerous part of the young turtles life to date. Timed, night releases are actually part of a well-developed system that rescues stragglers from 'natural' hatchings, and saves them from overheating in the heat of the next day's sun. The conservation staff take these ‘at risk’ hatchlings to Alagadi, where they are weighed and measured, before being released in the cool of the evening. Supervised releases reduce the risk of predation or confusion by lights, and allow visitors to witness this amazing sight and perhaps be more conscious of the need for conservation of pristine coastline as a result. And with only 300-400 green turtles nesting each year in the Mediterranean, every hatchling is precious! (The loggerheads are more numerous, with approximately 3000 females laying eggs each year.) It's the green turtles who need SPOT's help most, as approximately 30% of the Mediterranean breeding population nest in North Cyprus. The best way to find the Goatshed is to drive east out of Kyrenia towards Catalkoy and then towards Esentepe. Head for the Acapulco Hotel and carry on past it towards the power station. Look out for a turning on the left marked Alagadi, St Kathleen and the Turtle Project. Carry on down this road, take the left fork past St Kathleen restaurant, then turn right after the last house on the road. The Goatshed is the white house ahead of you, with a large green turtle painted on the side! Been turtle watching this year? Tell us all about it at our forum! This web page is served on 19 April 2019 at 23:49:38.